It’s time for a new sketch to play along with at Freshly Made Sketches. Our sketch hostess is the super talented Jen Brum. My card probably didn’t start out as a Christmas card, but the more I looked at the colours I’d chosen, the more I liked them for a Christmas card. I chose strips of Smoky Slate, Basic Gray & Crumb Cake DSP from my 6″ x 6″ Neutrals DSP Stack to layer across my card. I then added just simple leafage with some Mossy Meadow Sprigs and some leaves from Blended Seasons. The sentiment I used on my card is from Blended Seasons also. 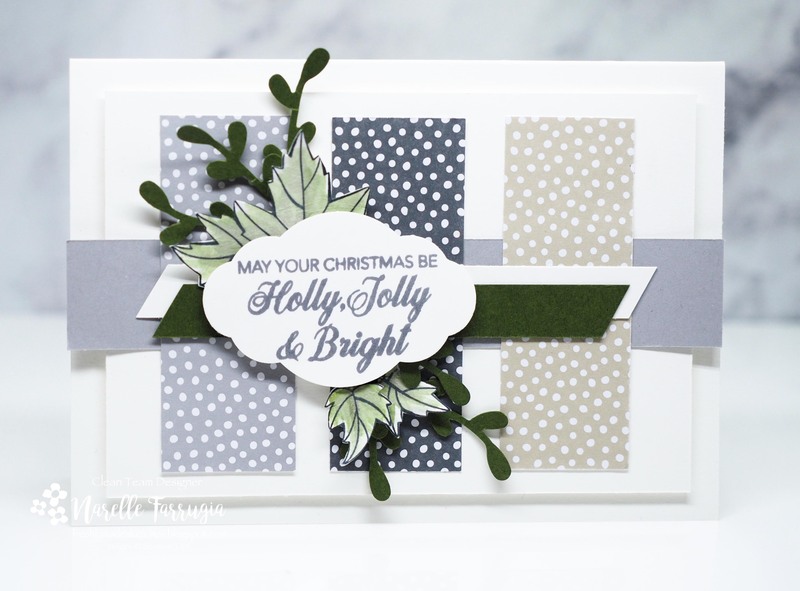 The team at Freshly Made Sketches have created wonderful cards using Jen Brum, head over to the challenge and take a look. Gorgeous Christmas card Narelle! I love those non-traditional colours and the leaves peeking out from behind your sentiment! So pretty! What a terrific Christmas card. I love these colors! I love how you made this into a Christmas card! The neutral colors make for a pretty Christmas color combo. Lovely card, Narelle! You are getting quite the collection of Christmas cards – I’m jelly 🙂 . This is another gorgeous card with wonderful patterns and layers. It’s a gorgeous color combo!! I love the dotted paper with the look of snow backing your lovely greenery.